When it comes to double tanks most exert divers will agree that equipment flexibility with dive gear is paramount to a safe dive. Proper scuba equipment configuration matters on all dives. It doesn’t matter if the dive is a wreck dive, deep dive, shore dive, or even a boat dive; we need our dive equipment to be flexible and in the proper configuration. While at first glance, double tank setups and flexibility should never be used in the same sentence, the world is changing fast. I seldom use doubles, but when I do there is some basic use/setup questions that I need to consider. The very first question you will need to answer is: am I going to need a manifold in my setup? Manifolds offer the capability of having an isolation valve. The isolation valve allows the tanks to be isolated from one another. If a regulator should fail underwater, the regulator could be isolated from the rest of the system. The manifold can be purchased without the isolation valve, but it seems that if two tanks need to be combined together because of the dive profile, a backup regulator should also be used. Manifolds can be pretty pricey and buying one without the isolation valve does not make sense. If you decide to purchase a manifold, then holding the tanks in perfect alignment is critical. Some divers use a set of semi-permanent tank bands to keep the tanks from shifting during the dive. If the tanks shift, then the manifold might bend with them and ruin the manifold. •	1-1/2 setup. Here the diver uses the first tank and ½ of the second tank. Once back to the boat or shore the diver replaces out the empty tank and repeats the process during the second dive. The difference between this setup and using a bailout bottles is the diver is planning to use the second tank, while a bailout bottle is used in emergencies. •	Independent doubles. This is a perfect setup when doing a boat dive to shore or a remote dry location. One tank is used getting there and another tank getting back. The Velcro bands are designed by Captain Dan Berg of Aqua Explorers. 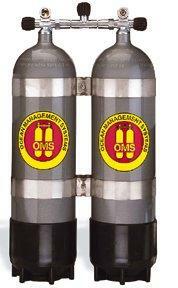 The main advantage is the capability to hold a double tank system to your BCD without the manifold. Manifolds are extremely expensive and will raise the height of the system by a couple of inches. If the straps are tightened down, they can hold almost as tightly as the steel bands. But there can be some shifting of the tanks, and a good manifold can be ruined when this happens. So a good recommendation is not using a manifold with Velcro bands.